Top marks for variety, at least, on this new disc of 'Great Operatic Arias' from American soprano Christine Brewer. Following on from her acclaimed first recital disc for Chandos' Opera in English series, Brewer now offers an even greater mix of music in the second volume. Handel, Gluck and Mozart rub shoulders with Wagner, Beethoven and Korngold, while the Anglo-American repertoire is represented by Britten and Richard Rodgers, and the disc is completed by Menotti, Dvořák and Lehár. A real mix of light and dark, then – but does it all work? One can understand Brewer's inclusion of the Countess' entrance aria and the Countess-Susanna 'breezes' duet from The Marriage of Figaro, since the Countess was a staple of her repertoire at one time, and her portrayal of the aria's pathos is particularly affecting. However, all five of the baroque and classical tracks on the disc fall short of the competition on record because of the sheer size of Brewer's instrument nowadays. She's now a splendid Isolde, Brünnhilde and Leonore, but the shift to heavy repertoire has given her voice a heft and prominent vibrato that doesn't suit the lightness of Mozart in particular. Judith Howarth is a charming Susanna, and the pair convey the wit of the two characters, but this is no competition for the great recordings of the duet readily available in the catalogue. The two arias from Gluck's Alceste (which Brewer will perform at Santa Fe in the summer) are more successful. The anguish of 'Where am I?' is well suited to an emotionally honest singer such as Brewer, and the same goes for the exquisite 'Great Gods! Cruel fortune has cursed me'. In both, Brewer's clarity of diction also aids her communication of the text, amply justifying the premise behind Sir Peter Moores' Opera in English series, while the depth and fruitiness of the orchestration also makes her voice sit more easily in the intricacies of the vocal writing of this period, even if the second aria in particular could be sung with a smoother line. Handel is more exposed and exposing, of course, but Brewer's rendition is surprisingly affecting, in spite of a fast vibrato that might upset die-hard purists. I'm slightly tempted to say that it's cheating to include Brewer's performance of Leonore's aria from Chandos' complete recording of Fidelio on this disc, but it's so brilliant that nobody could complain about hearing it again. However, the two highlights of the set are undoubtedly (and predictably) the Wagnerian items. Elizabeth's prayer from Tannhäuser is a particularly good fit for her, because both the character's temperament and the vocal writing are well matched to Brewer's natural abilities, but it's also a pleasure to hear her tackle Elsa's Dream from Lohengrin. These two performances are so good that it's a shame, in a way, that Brewer wasn't able (or inclined?) to record a whole disc of Wagner in English. Still, there's plenty still to enjoy here. Other than the Wagner and Beethoven, the stand-out performance is Magda's aria from Menotti's The Consul: it's thrillingly sung and chillingly delivered. Maretta's Lied is an inevitably comfortable fit for Brewer, too, and we're treated to the duet version with Timothy Robinson as a sympathetic Paul. I prefer a more vulnerable, lithe-voiced Ellen Orford for the Embroidery Aria from Peter Grimes, but Brewer still performs the piece with power. For me, Dvořák's 'Songs my Mother Taught Me' could be sung more hauntingly, and to my ears Brewer sounds uncomfortable in the famous duet from Lehár's The Land of Smiles – it lies awkwardly and calls for a creamier tone – but by the same token, her full-toned rendition of the Mother Abbess' 'Climb Ev'ry Mountain' from Rodgers and Hammerstein's The Sound of Music ranks with the best. With versatile accompaniment from David Parry and the London Philharmonic Orchestra, the disc is certainly an unusual selection of items, and even if they aren't all sung with equal success, it still confirms Brewer as an artist who's willing to push the boundaries and stretch her repertoire whenever possible. 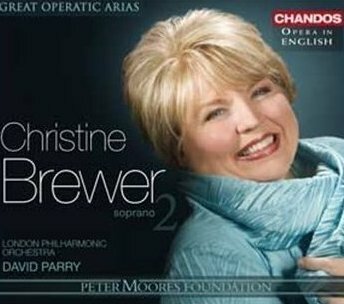 Christine Brewer: Great Operatic Arias Vol 2 is released on 2 March 2009.